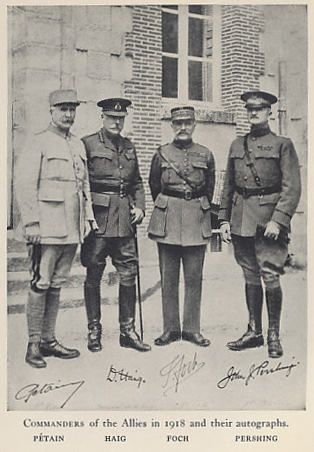 Commanders of the Allies in 1918 and their autographs. Douglas Haig commanded the First Army Corps when the British Expeditionary Force (BEF) deployed to France under Sir John French. 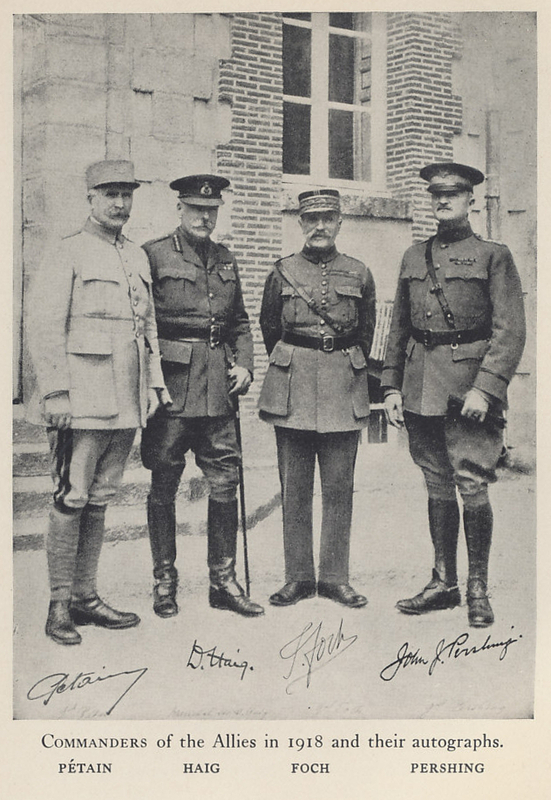 During the Allied retreat, Haig continued retreating on August 26, 1914, leaving General H.L. Smith-Dorrien on his left dangerously exposed. Smith-Dorrien suffered nearly 20% casualties in the Battle of Le Cateau. In the joint Allied offensive in the spring of 1915, Haig and Smith-Dorrien led a force of British and Indian troops to take the high ground of Aubers Ridge. Although they took the village of Neuve Chapelle, the offensive failed. At the Battle of Loos, Haig commanded the British First Army. The British suffered heavy losses. Given the casualty list and the failure of the offensive, the failures earlier in the year at Neuve Chapelle and Aubers Ridge began to look more systemic, an argument Haig made in writing. With that, and his friendship with the King, Haig was positioned to assume command when the government replaced Sir John French. Haig was appointed on December 10, 1915, and commanded British forces on the continent through the rest of the war. Most of his campaigns, including 1916's Battle of the Somme, were developed in conjunction with the French. But after Nivelle's disastrous Nivelle Offensive of 1917 and the subsequent French mutinies, the French were in no state to field a major offensive. Finally left to his own devices, Haig launched his own disaster, the Third Battle of Ypres, also known as the Battle of Passchendaele. Despite that, Haig retained his position through the end of the war.